Hi and welcome to the February Cross Canada Blog Hop and our theme - Succulents and Flowers! Several of the Close to my Heart Cricut cartridges have images of flowers and succulents, but the new Flower Market cartridge has the most choices. If you have any questions about any of the projects you see on this hop or would like to place an order, please contact your local Close to my Heart Consultant for more information. WE hope you will take the time to leave comments on our posts, as we love to get feedback from our viewers, whether it is about something you really liked, or a technique you would like to know more about. By leaving us comments, we get to hear what you like and what you would like to see more of. If you arrived at my blog from Brandy's blog, you are on the right track, but if you get lost along the way, simply return to Michelle's blog where you will find the list of all the bloggers. The new Close to my Heart Flower Market Cricut cartridge offers a variety of succulents and flowers as well as containers to hold them. In January, Close to my Heart presented a beautiful Welcome Home Wreath Kit available for free with a qualifying order. I was fortunate enough to get two of the wreaths and this is what I made with them. 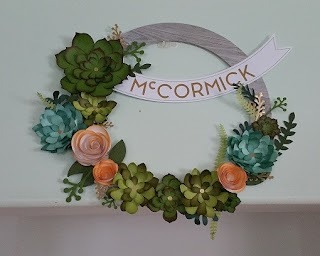 When I received the first wreath lit, I didn't want to make the wreath and it sat on my dining room table for a week or two before I had the idea to make the Designed Decor Frame shown here. (The frame is still available in the Clearance section of the Close to Heart website, by the way.) I love how it turned out and it is now hanging in my cube at work. My second wreath did end up as a wreath and is hanging above the stairs to the family room. There are no lower case letters on the sheets that come with the wreath so I made a lowercase C from half of an S. It worked perfectly! I also coloured the rolled roses with Tangerine ink before I rolled them. That's it for me this month. You can continue on the hop by heading to Corinna's blog for some more beautiful artwork. Next month's theme is all about the Close to my Heart stamps in other languages, so come on by April 15 and hop along with us again! 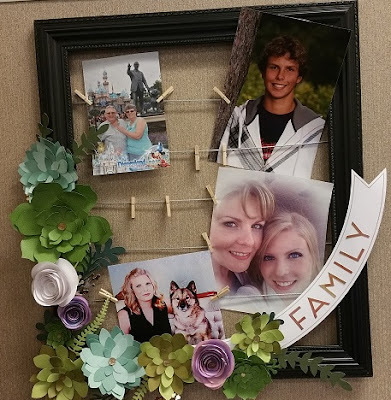 Absolutely LOVE your family decor frame. What a wonderful way to embellish it; you can update the photos as needed. I love that you have this in your cubby at work, to look at every day for inspiration. Thanks for sharing your talents!